A few weeks ago, I saw some jewelry at a festival that I really liked. 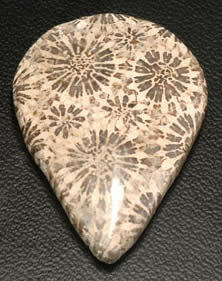 It was a slice of fossilized coral (similar to this) set into a pendant. Unfortunately, the cost was a bit out of my current price range, so I didn't buy the one I saw for sale. Then, a couple of weeks ago at the Santa Rosa Wednesday afternoon market, one of the vendors was selling little ammonite fossils. At $3 a piece, those *are* within my price range. :) So, I bought one, and decided I was going to figure out a way to turn it into a necklace. It was really, really simple to do, and I'm very happy with the results, especially for a first effort. I think with a little bit of practice, I could make things with this technique that would look much more professional. In fact, I'll probably do some of that. (Hah. Some of you may be getting jewelry this year for the holidays :D).